Several excellent books have been published that address one or more aspects of the diverse field of industrial mycology, but none of them cover the entire process of fungal bioactive metabolites discovery. Until now. 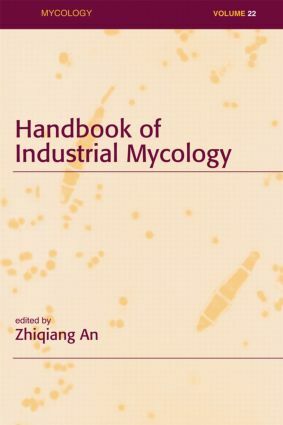 The Handbook of Industrial Mycology provides, in one volume, an overview of recent developments in industrial mycology with emphasis on the discovery of bioactive metabolites and, most importantly, their underlying biology and genetics. Two additional features distinguish this book from other books in the field: 1) most chapters are prepared using experimental data to illustrate theories and 2) the authors provide methodologies and experimental protocols in their chapters. Presenting a comprehensive overview of recent advances, the book provides a framework of basic methods, tools, and organizational principles for channeling fungal germplasm into the academic, pharmaceutical, and enzyme discovery laboratories. It covers the complex range of processes involved in the discovery, characterization, and profiling of bioactive fungal metabolites. The book includes examples of several recently marketed fungal metabolites and explores the impact of fungi on applications in the pharmaceutical, food and beverage, agricultural, and agrochemical industries. publication well suited for researchers engaged in further studying the biochemical basis for the functional effects of tea extracts or components and for healthcare professionals who are inclined to use traditional medicines…"
"An's book is in the same series of the two edited by Arora and is very much one of a triumvirate, largely complementary rather than duplicatory in content. …Especially well-researched, comprehensive, and authoritative, is the review of 'Biological activities of fungal metabolites' (Peláez). …my recommendation has to be the three superb and largely complementary Marcel Dekker volumes, carefully put together under the keen eye of the series editor, Joan W. Bennett." "…the handbook stands alone as a hefty reference guide to industrial exploration of fungi. …International literature is well-represented." "The enthusiastic introductory chapter is followed by a wealth of information about the nature, biological activity and taxonomic significance of fungal metabolites… .The book is packed with information and the Editor is to be congratulated on getting together an extensive team of contributors. Although most of the book is concerned with the beneficial use of fungi, one chapter is devoted to a general account of mycotoxins. …this book should surely be on the shelves of any laboratory involved with fungal biotechnology and is an excellent source of information for those involved with teaching and research on fungi."